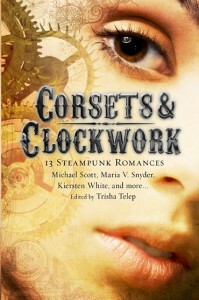 Corsets & Clockwork: 14 Steampunk Romances. Published in the USA by Running Press Kids. Publication date: 10th May 2011. Published in the Uk by Constable and Robinson. Publication date 26th May 2011. A few months ago an American editor called Trisha Telep got in touch with me, telling me that she was putting together an anthology of short stories on a Steam Punk theme, and asking me if I would like to write a story for the book. I said yes, I would, very much! Actually, I already had a story in mind that I had been thinking of writing for some time, and I knew this story would work really well in a Steam Punk genre. For those of you who don’t know what Steam Punk is, the basis for Steam Punk stories and books is of a Victorian world, with stories often set in 19th Century England - but in a world where electricity never really took off and steam power fuels everything. In the Steam Punk world, many inventions have come early - inventions such as computers and airships and submarines and tanks - and all the machinery is huge and cumbersome. In a way, it’s a kind of science-fiction but with everyone dressed in Dickensian clothes and very little electricity. If you Google steam punk, you’ll get some idea - and if you Google Steam Punk Fashion - you’ll see the kind of amazing clothes people wear! Bestselling romance editor Trisha Telep brings an exciting new element to the fast-growing sub-genre of steampunk, which bends and blends the old and the new in increasingly popular dark urban fantasies. Young heroes and heroines battle evil, in various forms with the help of super-technological or supernatural powers, while falling in and out of love. The contributors include: Ann Aguirre a bestselling author who writes urban fantasy (the “Corine Solomon” series from Roc), romantic science fiction (the “Jax” series from Ace), apocalyptic paranormal romance (as Ellen Connor, writing with Carrie Lofty, from Penguin), paranormal romantic suspense (as “Ava Gray from Berkley”), and post-apocalyptic dystopian young adult fiction (”Razorland and Wireville” coming in 2011 from Feiwel & Friends). Tessa Gratton, her debut novel “Blood Magic” arrives in 2011 from Random House Children’s Books, followed by the companion “Crow Magic” in 2012. Jaclyn Dolamore is the debut author of “Magic Under Glass” from Bloomsbury USA. Lesley Livingston is the award-winning author of “Wondrous Strange and Darklight”, the first two books in the bestselling trilogy from HarperCollins. Frewin Jones is the bestselling author of the “Faerie Path” series and the “Warrior Princess” books, among many others. Caitlin Kittredge is the author of the “Iron Codex” trilogy, a Lovecraftian steampunk adventure. Dru Pagliassotti’s first novel “Clockwork Heart” was one of the first in the rising new genre of steampunk romance and was named by “Library Journal” as one of the five steampunk novels to read in 2009. Dia Reeves is the debut author of the critically acclaimed “YA Bleeding Violet”. Michael Scott is the Irish-born, “New York Times” bestselling author of the six part epic fantasy series, “The Secrets of the Immortal Nicholas Flamel”. Maria V. Snyder is the “New York Times” bestselling author of the “Study” series (”Poison Study”, “Magic Study”, and “Fire Study”) about a young woman forced to become a poison taster. Tiffany Trent the author of the acclaimed “YA” dark fantasy series “Hallowmere”, which was an IndieBound Children’s Pick and a New York Public Library Book of the Teen Age 2008. Kiersten White is the debut author of “Paranormalacy”, the first book in a new trilogy, which was published by HarperTeen in August of 2010. Adrienne Kress, is the author of “Alex and the Ironic Gentleman” and “Timothy and the Dragon’s Gate”. Plenty of interesting stuff there, I think! My story is called The Cannibal Fiend of Rotherhithe and concerns the adventures and misadventures of a beautiful half-mermaid girl called Silka who escapes from the confinement her human father has kept her in for 16 years, and who travels the length of England in search of her “true love”. When I say she “escapes” - what actually happens is that she kills her father and..well…eats him, before quitting the cottage where he had kept her chained up for the whole of her life. Well, it kind of serves him right for never teaching her that eating people is a bad thing. She makes it all the way to London before meeting a vagabond boy called Tobias Hart - who becomes her only friend. The problem here is that Tobias is being hunted down by the authorities, and they are close on his heels. Another problem is the fact that Silka has been killing people and eating them. If only her father had brought her up right!